SAN REMIGIO, CEBU (August 04, 2017) – The Municipality of San Remigio through the Rural Health Unit headed by Dr. Orleta B. Ursal conducted the first ever “Search for Healthy Buntis 2017.”This activity is in line of Nutrition Month Celebration, July being a busy month for this month-long program. At least 20 pregnant women joined the said activity last July 28, 2017 held at Mayor Artemio T. Masbate Sports Complex in San Remigio. 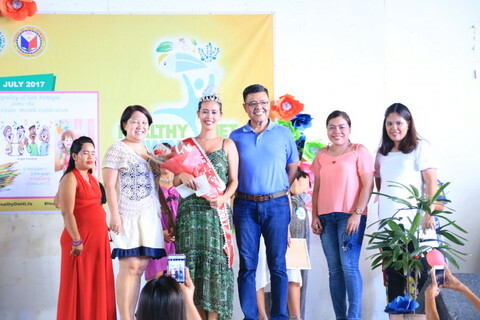 Gracing the affair were Mayor Mariano R. Martinez, SB Member Miguel Martinez, Municipal Health Officer Dr. Orleta B. Ursal, Doctor sa Barrio Dr. Gerard Ismael, Municipal Dentist Dr. LouellaLecciones and some barangay officials and BHWs. There were three members of the panel of judges who scored the three exposures consisting of “Opening Production,” “maternity dress wear,” and the “Question and Answer” portion. “Tan-aw nako, kini mga contestants dako naman kaayo ni sila ug participation to the success of this event kay dili man gyud tanan makadaug. Busa aron sa pagtugot nalang sa ilang bana sa pag-apil maoy atong huwaton, pwede ato nalang e-libre sila sa bayronon sa pagpanganak sa atong birthing center,” he added. According to Dr. Orleta B. Ursal, participants should be at least six-month pregnant and have undergone regular prenatal to qualify for the said activity.